It was a powerfully bullish month for world equity indexes. Net monthly changes ranged from 22.5% (Russia), 5.6% (USA - Dow), to 2.9% (UK). With the ECB QE-pomo train set to arrive in the EU this March, most equity markets look set for continued gains into the early summer. Despite some real concern about an exit from the Euro, with a four month bailout extension, the Athex soared into end month, with a rather extreme monthly gain of 22.0%. First upside target remain the 1400s. 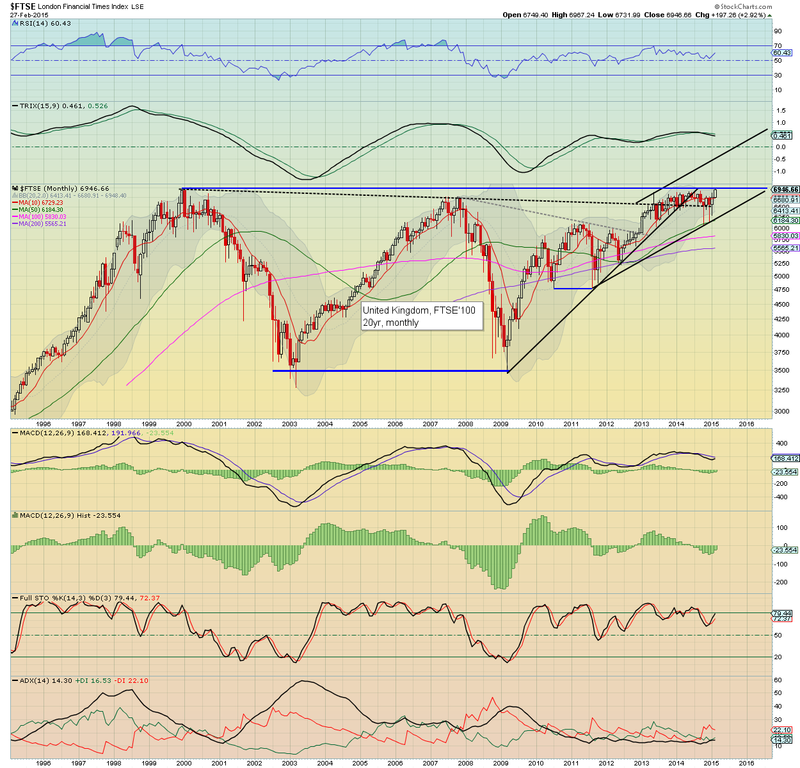 A monthly close in the 1500s at any point this year will arguably confirm that the 2500s are viable in 2016. The Bovespa soared a very powerful 10.0%. Next upside is the 60k level, which is another 18% or so higher. If commodity prices can stabilise.. and start to climb this summer, the Brazilian market has a chance at breaking key resistance of around 65k. 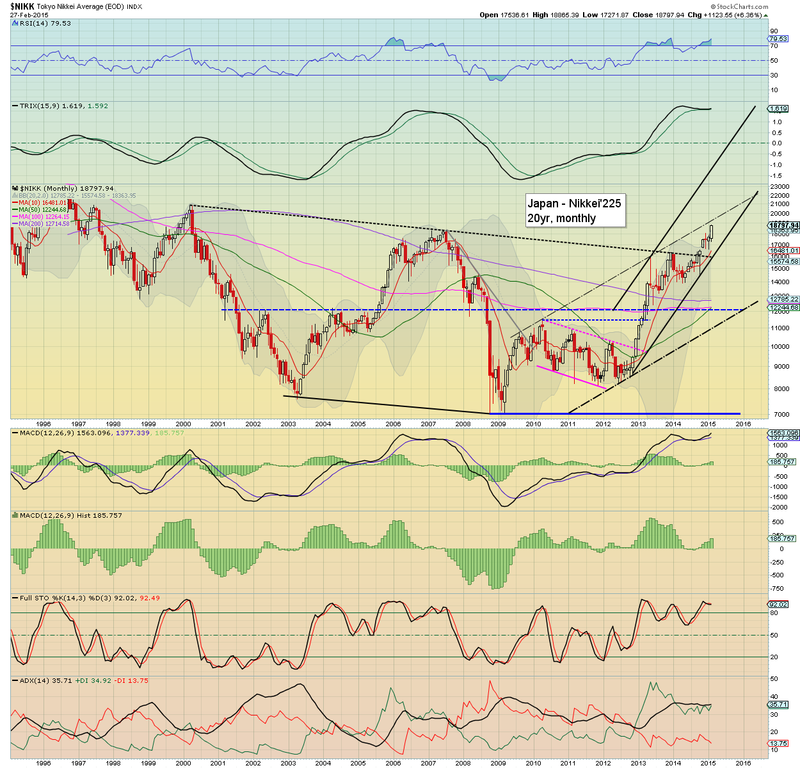 A hyper-bullish target of 100k by 2017 remains very valid. The CAC continues to soar, with a net Feb' gain of 7.5% @ 4951 - the highest level since May'2008. The giant 5k threshold looks due in March. 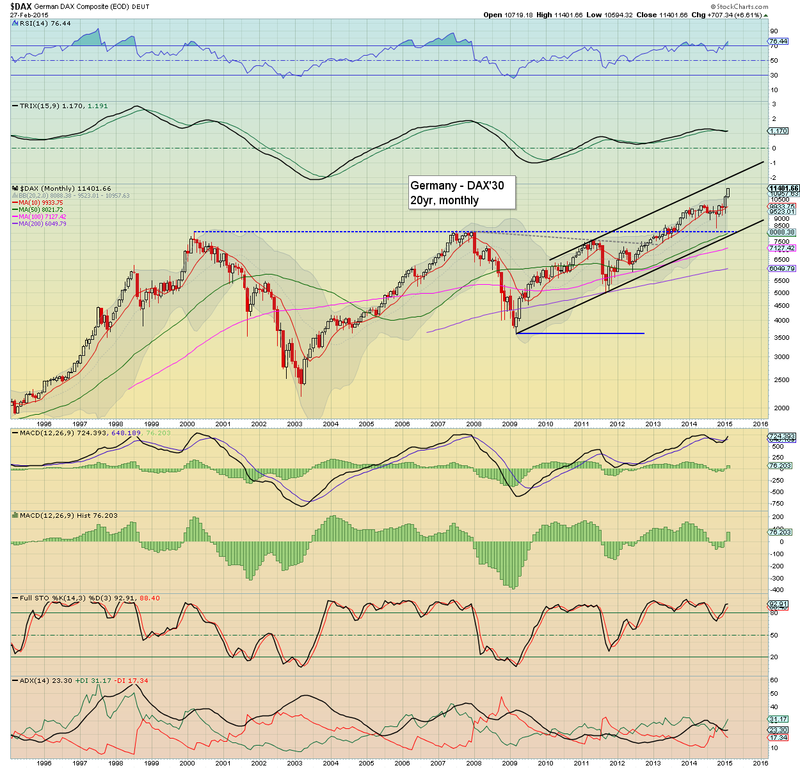 There is clear trend resistance around 5k, but with the ECB QE-pomo, there is viable accelerated upside into the 6000s this summer - back to the 2007 peak. The economic powerhouse of the EU continues to roar, with an impressive gain of 6.6% into the 11400s. There is viable upside to 12k this spring. The Oct' spike floor in the 8000s now looks a very long way down... and will probably not be re-tested for some years. The UK market finally broke the Dec'1999 high, with a Feb' gain of 2.9%. The giant 7k threshold looks set to be achieved in March. From there... the 8500/9000 zone looks very likely this year. 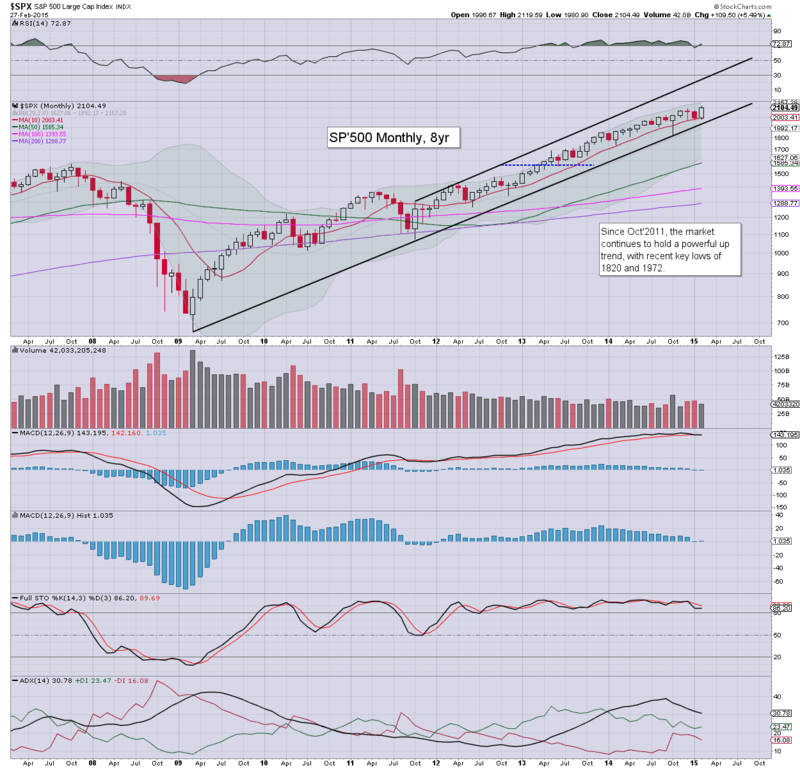 Any monthly close in the 7000s will arguably confirm an eventual move to the giant 10k level. 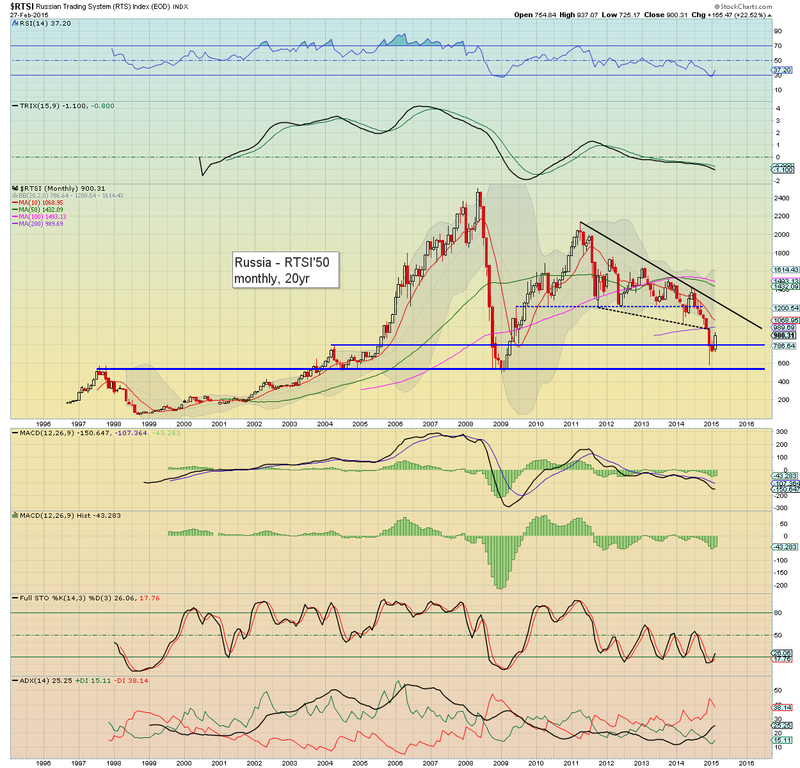 The ugliest of the EU PIIGS - Spain, managed a strong gain of 7.4% into the 11100s. Key resistance at the 12k threshold looks set to be tested by April/May. 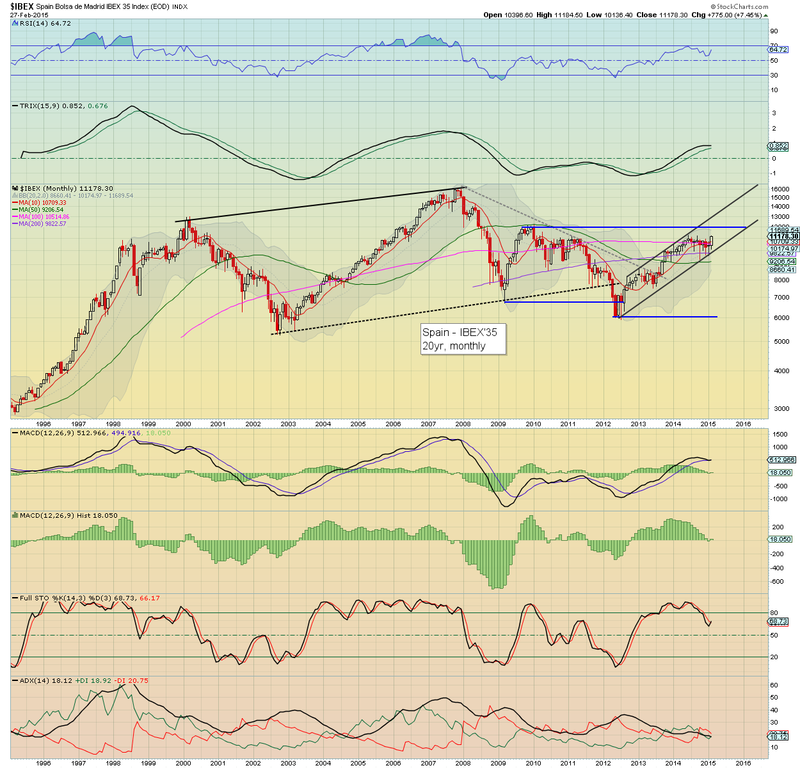 Any monthly close in the 12000s will offer a straight run to the 16000s within the next 9-15 months. The mighty Dow climbed a very significant 5.6% this February... with a new historic high of 18244. 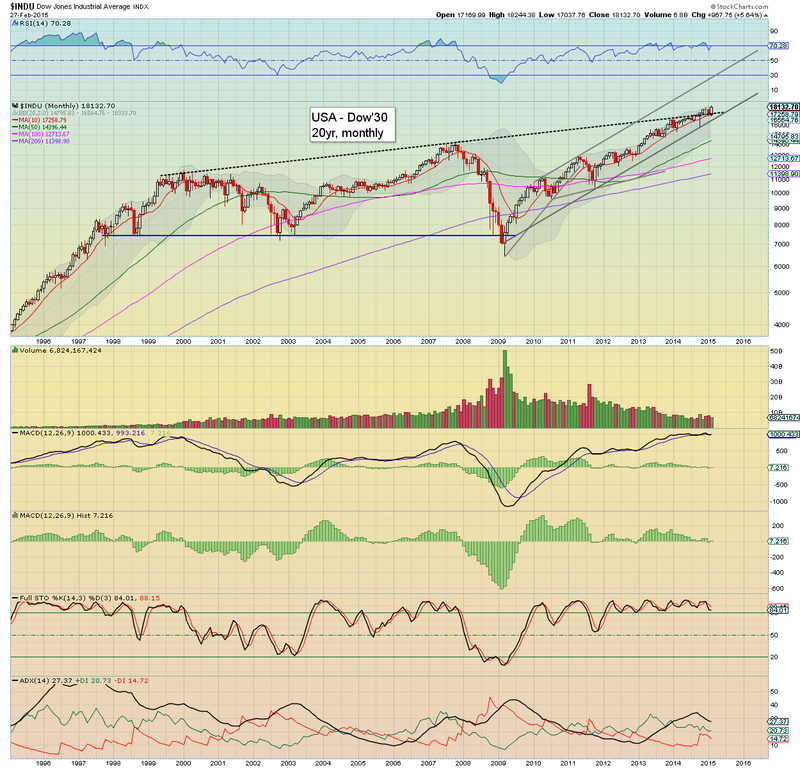 The upper bollinger will be offering the 18400/500s in March. 19K looks a little difficult until May/June. 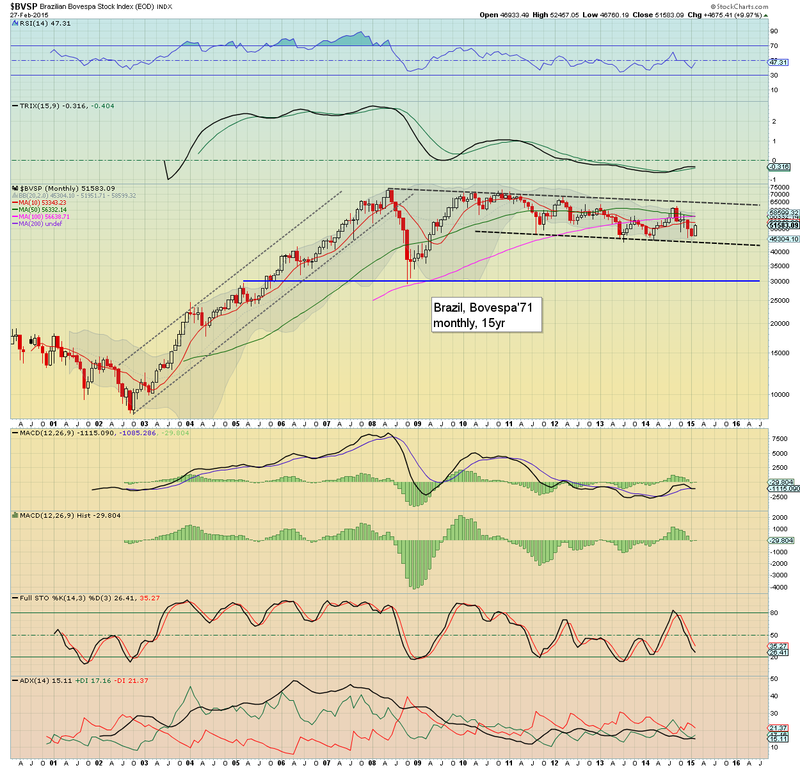 Any monthly close in the 19000s should clarify that Dow will be trading in the 23/26k range no later than spring 2016. The BoJ fuelled Nikkei is soaring, with a net gain of 6.4% in the 18700s. The 20k threshold looks due by early summer. The only issue is when the current rally goes truly hyper. With continued (and accelerated) equity purchases from various central banks... the Nikkei is going to have a chance at the Dec'1989 high of 38957. That is of course a clear doubling from current levels. 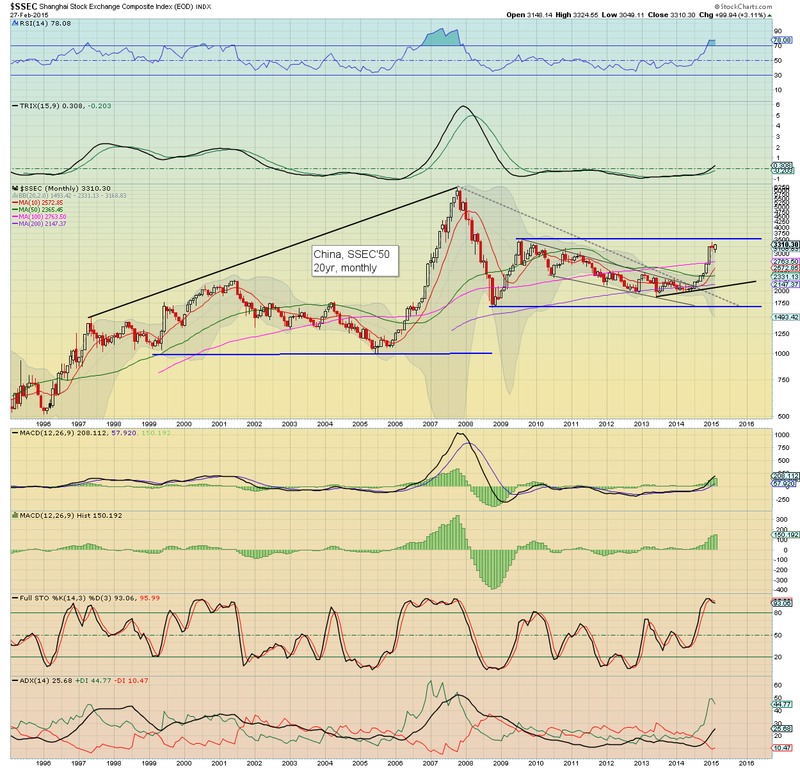 Despite broadly weak energy prices, the Russia market saw a pretty extreme net monthly gain of 22.5%.. back into the 900s. However, if Oil fails to hold the recent WTIC Oil low of $43, then the Russia market will have a high likelihood of re-testing the 600s.. or even 500s. In terms of the grander multi-year cycle though, the Russia market is arguably in the process of building a solid multi-month floor (much in the style of late 2008/early 2009) before a massive push back over resistance - currently in the 1200s. The China market saw renewed strength, with a significant net monthly gain of 3.1% into the 3300s. Key resistance in the 3500s looks set to be tested... and broken through. 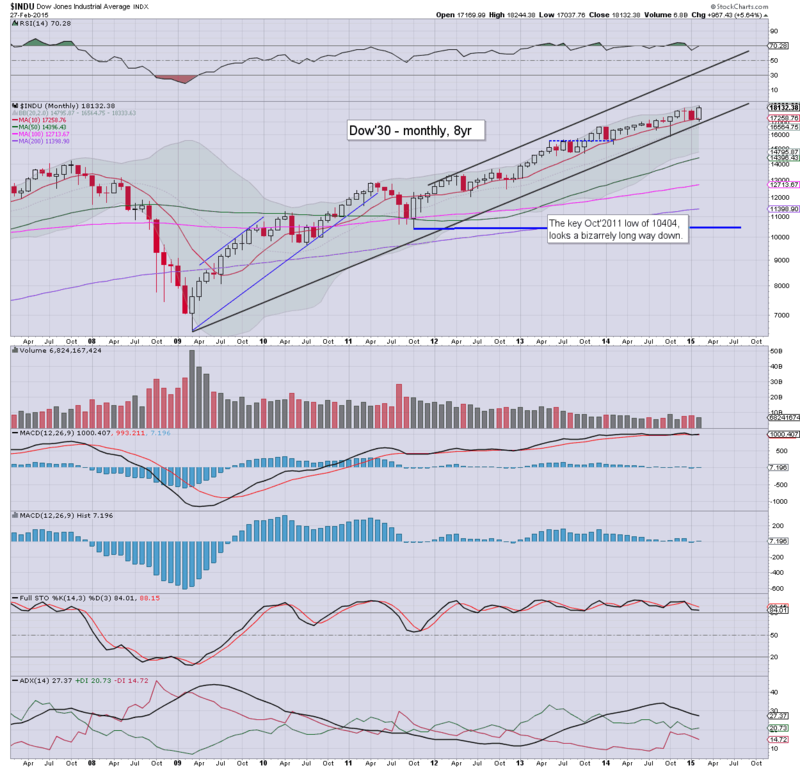 Any monthly close in the 3600s should clarify that 5K is due before year end... and new historic highs in 2016. It was unquestionably one of the strongest months for world equities in some years. We have a number of indexes breaking new historic highs (Dow, DAX, FTSE). Even the basket-case economies of Greece and Spain saw powerful net monthly gains. 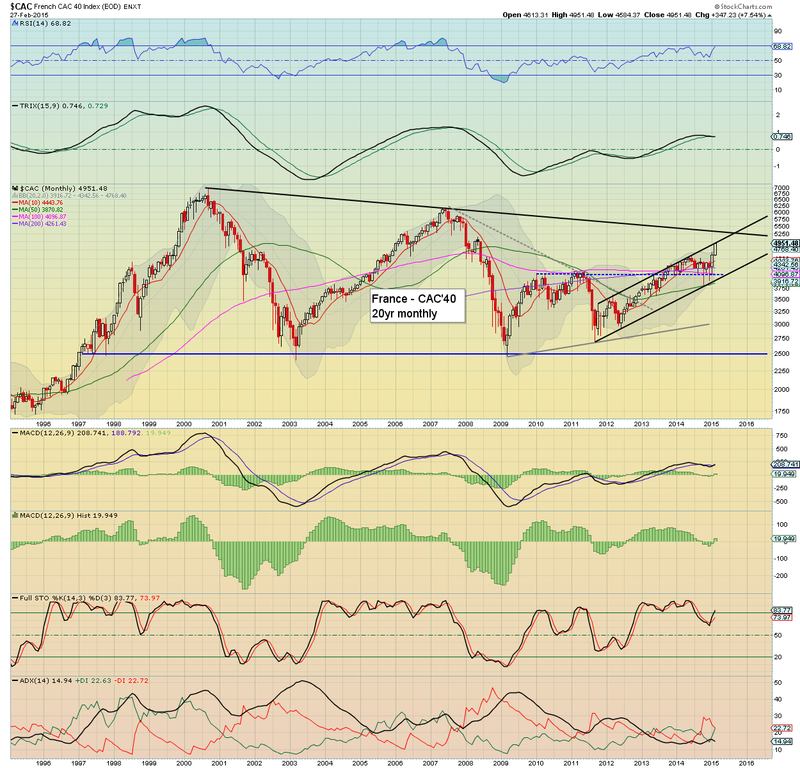 With the ECB QE-pomo train set to arrive in the EU this March... there is the threat of accelerated upside. All that seems to be missing is some strength in commodity prices. Most world markets look set for broad upside for another two years. If we see a bubble peak in 2017, we could be looking at Dow 35/40k, DAX 20k, FTSE 12/14K, and Shanghai Comp' of 10/12k. I realise those will be considered as 'crazy talk' by many, but then.. the central banks seem 100% intent on ramping asset prices for the foreseeable future. Indeed, the ECB have already stated that the QE-pomo program will last at least to Sept'2016. ... back at the Monday open. US equities saw powerful net monthly gains in February. 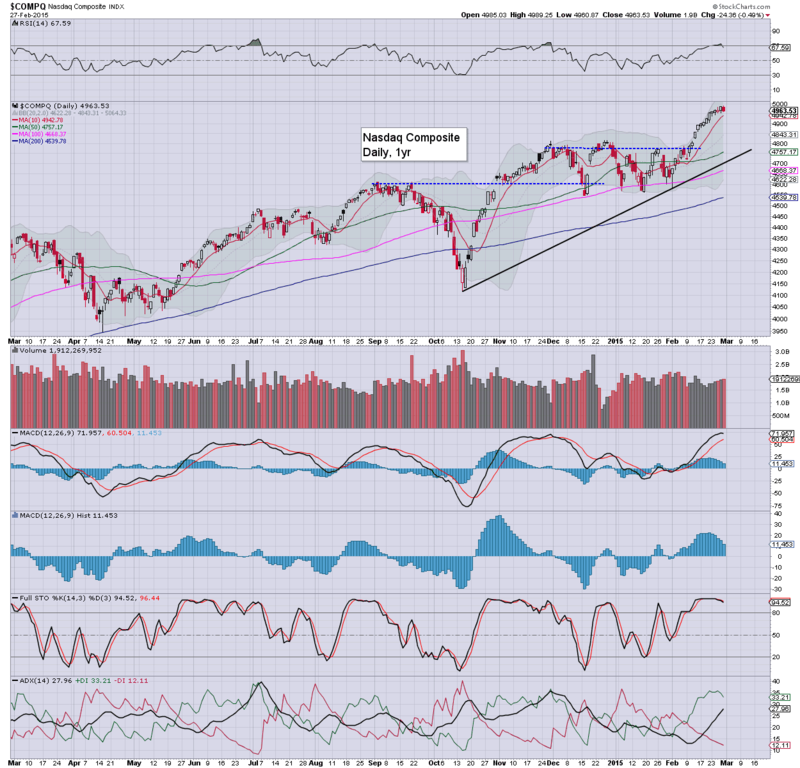 The sp'500 climbed 109pts (5.5%), with a new historic high of 2119. The Dow soared 967pts (5.6%), with a new high of 18244. The broader outlook remains starkly bullish. It has been a particularly difficult and tedious week. Despite net daily declines across Wed, Thurs, and into the Friday close... price action has been very subdued. It remains a very complacent market.. but then... Mr Market is well aware that the ECB QE-pomo train will arrive in the EU sometime in March. That will be a hugely bullish underpinning to most world equity markets until late 2016. There is simply ZERO reason why the market can't keep on climbing for another two years. US equity indexes closed lower for the third consecutive day, sp -6pts @ 2104. The two leaders - Trans/R2K, settled lower by -0.6% and -0.5% respectively. 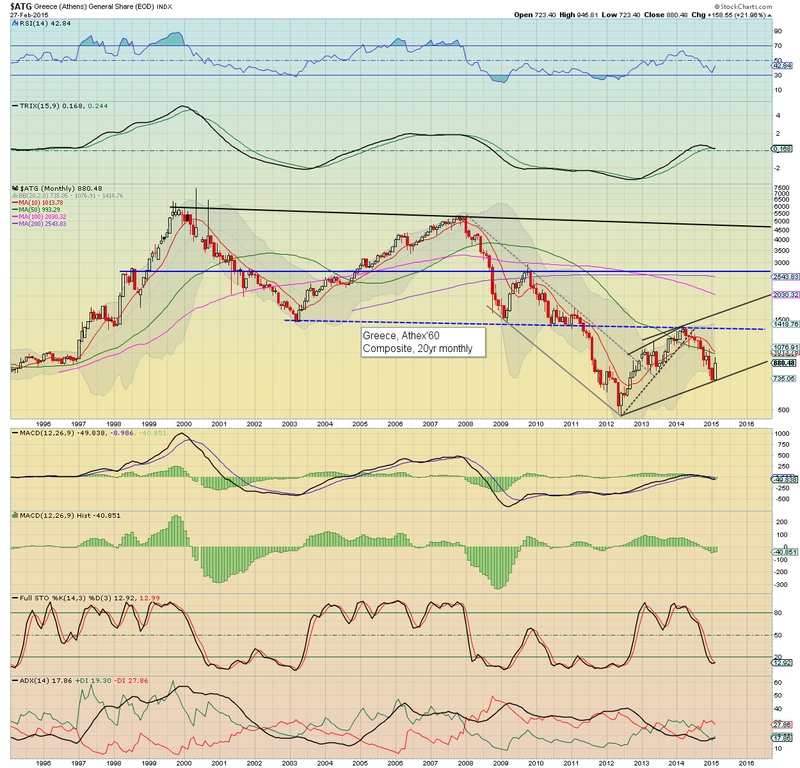 Near term outlook offers the sp'2060s, before renewed upside into April/May. Suffice to say... despite all the cheer leading on clown finance TV about Nasdaq 5K... it again fell shy. 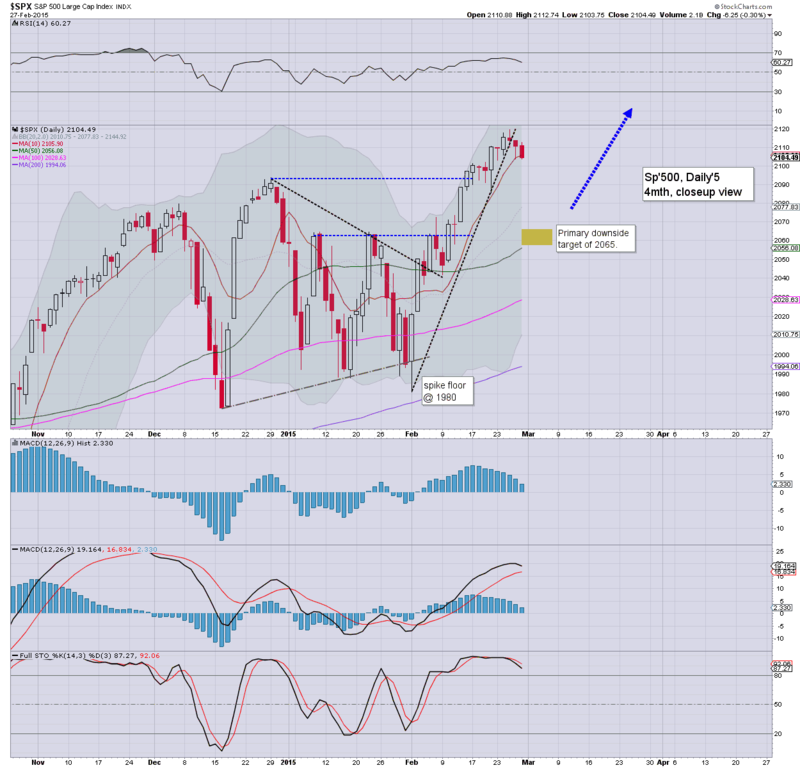 It looks like we have a short term top of sp'2119... with a minor retrace to the 2060s by next Wed/Thursday.